Last week, the technical meeting for the upcoming 2nd International Conference for Nutrition was held at the Food and Agriculture Organization (FAO) headquarters in Rome, Italy. The purpose of the meeting was to gather experts to hear country feedback and set the agenda for the main event, which will take place in November 2014. TCi Program/Research Manager Katie Ricketts participated along with director Prabhu Pingali and Cornell professor David Sahn to offer policy suggestions and describe the research TCi has been conducting to improve nutritional outcomes through targeted agricultural policies. Here, she reports back. 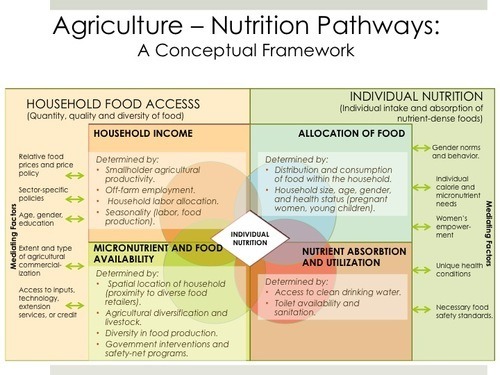 To many people, the pathways between adequate nutrition and agriculture are obvious. Rural families who are dependent on agriculture for both their food and income can greatly benefit from increasing farm productivity; this can allow them to grow more food for home consumption while earning more money per acre. Yet the pathways between agricultural interventions and nutritional outcomes are neither well understood nor adequately empirically documented. Despite gains in productivity in places in like India, China and Brazil, malnutrition and hunger persist. What kinds of agricultural policies can improve nutrition? Improving the quantity of food produced isn’t agriculture’s only contribution to better health and nutrition. Efforts to increase the diversity of food produced and the availability of micronutrient-rich food for rural communities can impact the ‘hidden hunger’ and micronutrient deficiencies which disproportionately affect rural women and children. The development of agricultural technologies that reduce the amount of time a women spends doing agricultural activities can support women’s health and preserve time for childcare and breastfeeding. By refocusing research efforts towards genetic and farm management improvements for crops that are especially important to women, we can enable women to access higher income-earning opportunities and encourage the adoption of nutritionally-enhanced varieties, which can promote female empowerment and decision-making. In Rome, we outlined our current policy thinking, which focuses on prioritizing agriculture-nutrition policies relative to the specific agricultural systems that exist in the communities targeted. Broadly speaking, we created a typology useful for focusing three key areas of agriculture-nutrition policy: 1) food supply and rural income growth (especially productivity gains); 2) food value chains (linking farmers to markets); and 3) distribution and safety net programs that can ensure access to dietary diversity. Moreover, we contextualized these policy approaches relative to certain types of agricultural systems. In our work, we characterize three types of systems broadly by per-capita income, level of agricultural productivity, and general nutrition challenges. Check out our full presentation here.